Kentwell Hall in the rolling Suffolk Countryside was the setting for the 2004 get together of the APT (Association of Pole Lathe Turners), when over 160 members came together for a packed event. As has been seen previously in this Journal, Pole lathe turning and the whole sector of greenwood crafts has seen a resurgence in the last decade and pole lathe turners, hurdle makers and rustic woodworkers are now a regular sight at most country shows. They can even be seen amongst the machinery stands at conventional woodworking shows. Jim Steele (left) won the Woodland Heritage trophy for his Yew wood rocking chair and was presented with the trophy by last year's winners. The APT was founded 13 years ago in order to revive the traditional skills and use of the pole lathe. Since then it has seen a huge upsurge in popularity and membership currently stands at 560 throughout Britain with a few overseas members from as far away as New Zealand and Australia as well as Germany, France and Belgium. Members receive the Bodgers Gazette 4 times a year; a magazine full of useful tips, techniques and reports on what is going on in the world of greenwood crafts. Once a year the APT holds its AGM over a weekend when all members are invited to attend two days of workshops, competitions, demonstrations and share ideas. This annual event moves around the country to different venues and locations. 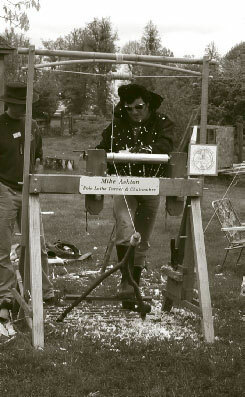 In 2004, during a packed event, there were workshops on rush seating techniques, arbortecing seats, bowl and goblet turning, as well as talks on the problems of wood boring insects and the history of woodware. Robin Wood, Britain’s only professional pole lathe bowl turner, gave an amazing demonstration of turning a ladle on the lathe, definitely not for the faint hearted as the handle swung by within an inch or two his fingers. Robin has studied the history of English wood ware in great depth and is currently researching and writing a book on the subject. Nick Abbott caused a few mutterings by demonstrating how to dish a chair seat using an Arbortec, something that would once have been considered heresy among the non-power tool brigade only a few years ago. This highly effective tool certainly takes the “back-break” out of adzing seat bottoms. Was this the moment the APT came of age by embracing technology? Shock Horror! The Woodland Heritage prize for the Best in Show was won by Warwickshire, Windsor chair maker Jim Steele for his amazing rocking chair in Yew. This was the fifth year that Woodland Heritage have sponsored this event and Jim was presented with the trophy by last year’s joint winners Mikhail Schutte from Germany and Pete Wood (as featured in last year’s journal). Ben Orford shows how to prepare a bowl blank for the pole lathe. As always there was an extensive exhibition of work from members, chairs, stools and a host of other turned work proving that you don’t have to have a fancy, costly electric lathe to produce top quality turnery. However, the question always asked of the APT is why a band of enthusiastic pedal powered wood turners are known as Bodgers? Well the answer is that no one is quite sure. The origin of the term ‘bodger’ is unclear, but it is said by some to come from the similarities to the word ‘badger’ – as the bodger worked out in the woods in rough conditions, was often unshaven and like the animal, emerged from the woods at dusk. The modern and rather derogatory use of the word ‘bodge’ may well derive from the fact that many bodgers made only chair legs, which were then taken away to be assembled in the chair factories of High Wycombe. Thus, the bodger only partly made the chair, hence a ‘bodged job’ of something not being fully done. But then again, ‘Bottcher’ was a German word for a cooper, or travelling craftsman so the origin may lie somewhere in our shared Germanic language. Despite the corruption of languages, the true bodger was (and still is) a highly skilled craftsman, able to make a range of round wooden components. Traditionally he led a nomadic life travelling from site to site working a wood before moving on. The cut, or coppiced wood was then left to regenerate until such a time as the regrowth would yield another crop of useable timber. There's a guy turns down the APT swears he's Elvis. The true bodgers of old are an extinct breed belonging to an age long gone, and rightly so, for the romantic image of the noble craftsman making his living in the woods is far removed from the poverty and drudgery of a real bodger’s life. Paid a pittance for his work, he had to work literally from dawn till dusk to earn the meagrest of livings, whilst the thousands of chair legs he turned out were bought by the Wycombe chair factories and made into Windsor style chairs which went all over the Empire. The majority of today’s APT members are hobbyists and interested amateurs. However, a few are professional chair makers, but unlike the original bodgers who made only the legs and rails, today's makers build the entire chair. The pole lathe is one of those beautifully pieces of technology with a mesmerising action, so simple yet effective. The APT is almost solely responsible for keeping this craft alive and introducing a significant piece of our history to a new generation. How many of those electric turners of today are aware that their heritage comes from the men and women who turned their wares by leg power alone. The APT committee would like to thank Woodland Heritage for its continued support and for sponsoring the Annual Best in Show prize at the AGM.